Published: Jul 30, 2018 · Modified: Apr 11, 2019 · By Jen Sobjack · This post may contain affiliate links. 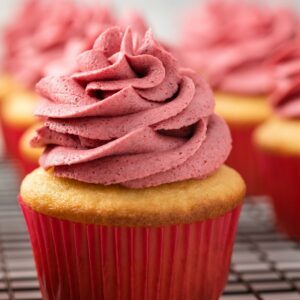 This creamy Raspberry Frosting recipe uses freeze-dried raspberries for intense raspberry flavor. It makes enough frosting to frost a 2-layer cake or 24 cupcakes. I’ve played around with different ways of making flavorful fruit frosting and so far the best has been with freeze-dried fruit. I tried this first with my pineapple frosting and it turned out amazing. I decided to give it a go once more but with raspberries this time. I can’t sing enough good praises about. I paired it with a lemon raspberry cake and it was phenomenal. You need one and a half cups of freeze-dried raspberries. Grind the raspberries down into a fine powder using a food processor. This should give you about one-third cup of raspberry powder. 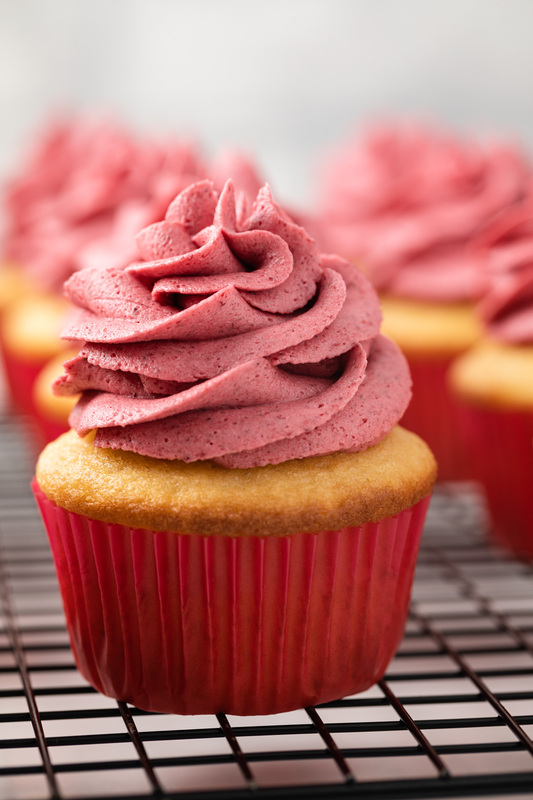 Mix the powder into a basic buttercream base and you’ve got yourself one amazing raspberry buttercream! 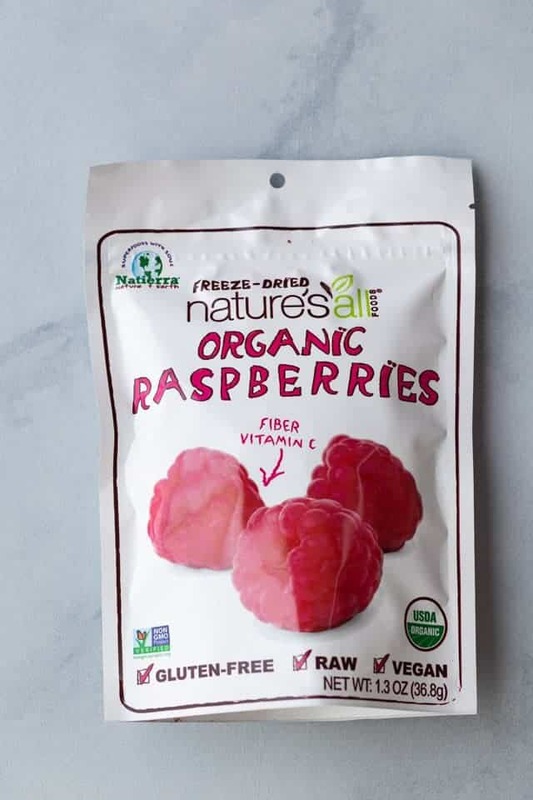 Where do I find freeze-dried raspberries? I’ve seen them in the dried fruit sections of Target and Publix. Trader Joe’s also carries them. If you can’t locate them in a store near you, they are available on Amazon. 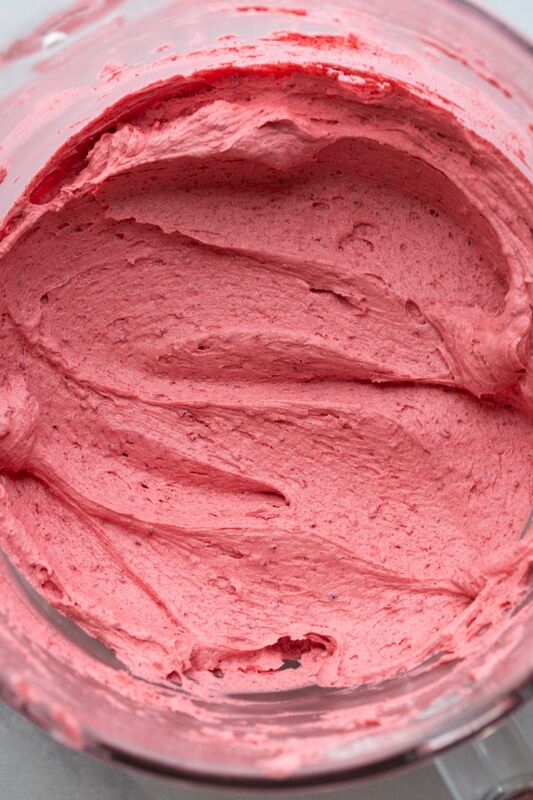 Can you use this raspberry frosting for cupcakes? This frosting is perfect for cupcakes or cakes. It makes enough to frost 24 regular size cupcakes. Is this raspberry frosting for chocolate cake? Raspberry frosting and chocolate cake are practically made for each other. Try my chocolate raspberry cupcakes with this frosting instead of the jam frosting called for in the recipe! 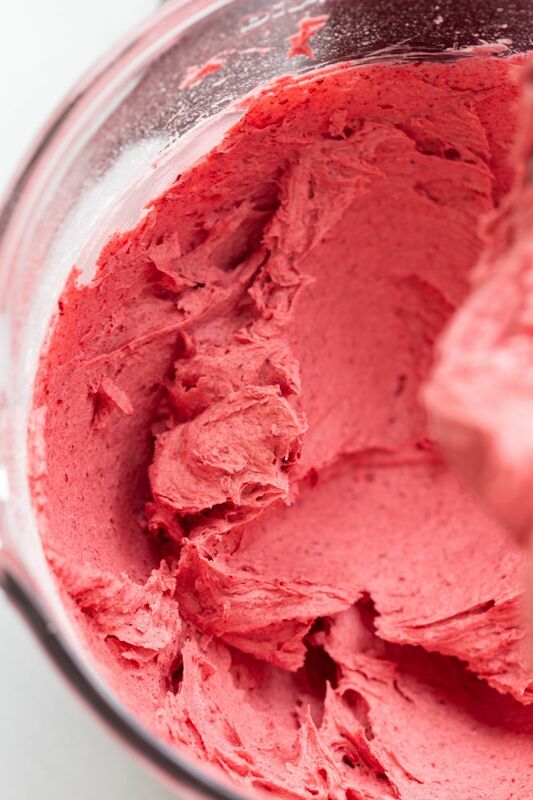 How to make raspberry buttercream frosting? Use a small food processor and pulse the raspberries until they are ground into a fine powder. This should yield you about 1/3 cup of raspberry powder. Start with room temperature butter and beat it on medium-high speed for about 5 minutes. It should be smooth and creamy. Add one cup of the confectioners’ and the raspberry powder. Mix on low speed until the dry ingredients are moistened. Repeat with remaining confectioners’ sugar, adding only one cup at a time and mixing after each addition until it’s fully incorporated. With the mixer on low speed, add vanilla, salt, and 3-5 tablespoons of heavy cream. Continue to beat the frosting until it’s super light and creamy. Raspberries have unpleasant seeds that won’t break down all the way during processing. If you want a super smooth buttercream, sift the ground raspberry powder through a small fine-mesh sieve to separate the seeds. 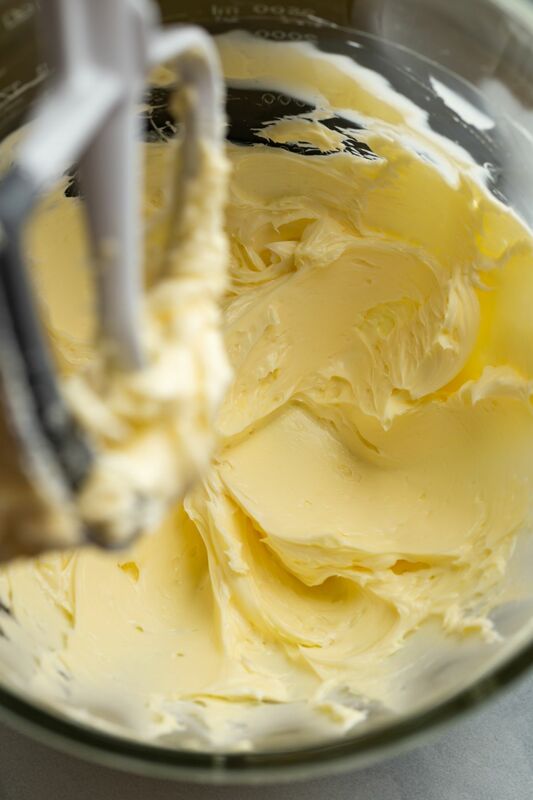 Make sure you are working with room temperature butter so the frosting comes together easily. It’s always best to set the butter on the counter to soften about and 30 minutes to an hour prior to use. 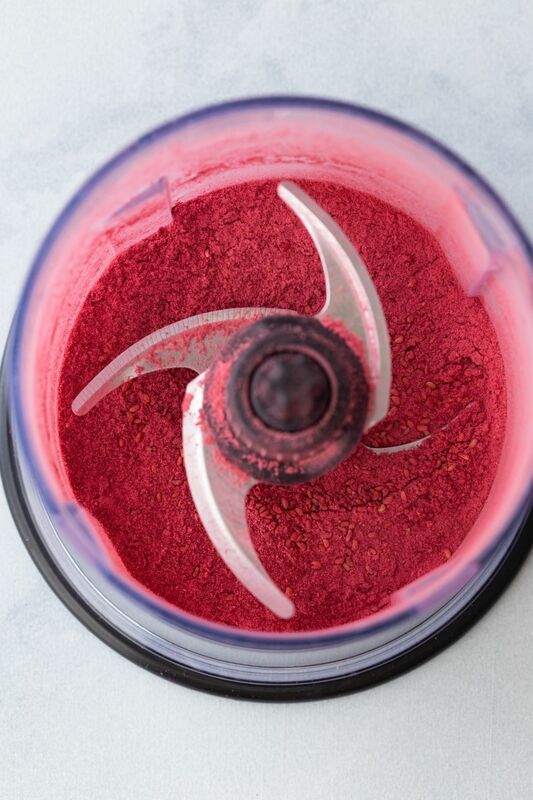 Use a food processor to grind the freeze-dried raspberries into a fine powder. Set aside. In a large mixing bowl, beat the butter with an electric mixer on medium speed until creamy and smooth, about 5 minutes. Add the raspberry powder and one cup of the confectioners; sugar. Beat on low speed until well mixed in. Gradually add the remaining sugar, mixing well after each addition. Add the vanilla, salt, and two tablespoons of heavy cream. Mix on medium-low until combined. Continue to add as much of the remaining heavy cream needed to make a smooth spreadable frosting. If you’d like you can sift the ground raspberry powder through a small fine-mesh sieve to remove seeds that are not broken down. Delicious! I tasted it throughout the process and I really liked the tartness it had before adding the vanilla and cream but the texture was perfect. Thanks for commenting, Ariel! I’m happy you enjoyed the frosting!! White chocolate ganache sounds divine! So great to hear it worked out beautifully in the frosting! 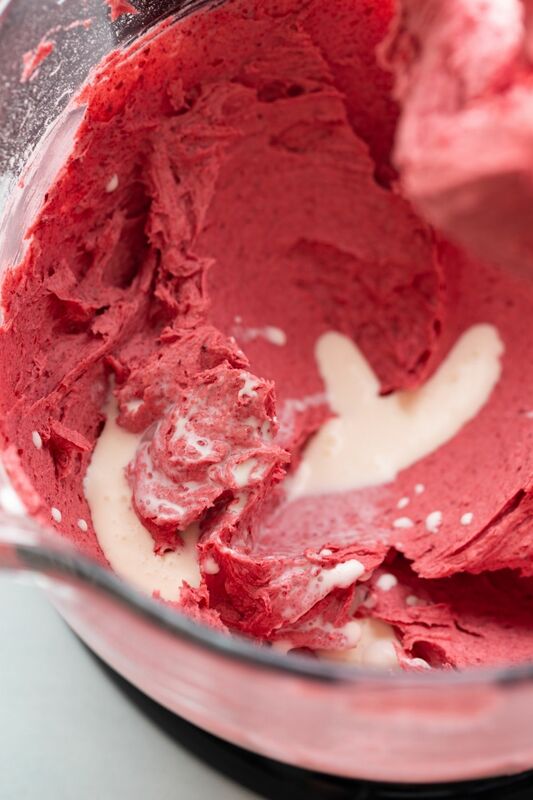 Using freeze-dried raspberries is a genius idea for frosting!